While there will be some teams looking to prepare for winning the FIBA World Cup, there are plenty of teams who have a modest approach to the big event this summer. The bookmakers have made it clear that they see Team USA and Spain as being a world apart from every other team, and it would be a major shock if someone either of these two teams triumphs in Spain. This isn’t to say that the tournament is without drama or excitement, there will be plenty of great basketball action in store, but it may be that the final offers up no surprises. The nature of Spain and America’s route to the final is such that if both teams keep winning games, they will only meet in the final. If it looks as though other teams are there to make up the numbers, they probably haven’t been told because there are countries that are greatly looking forward to the event. Finland are still rejoicing at qualifying for their first ever FIBA World Cup and while the country is there, they may as well as enjoy themselves. Captain Hanno Möttölä has been carrying out a range of interviews leading up to the big event and the sense of excitement around him, and the team, is palpable. One of the things that really drives many sports stars is the camaraderie that they have with their team-mates and the bond that comes from being on the road with their friends. Möttölä is a name that many basketball fans will know because he was a key figure in the late 90s in the USA. This was a fantastic time for basketball in Utah and Möttölä played alongside names such as Michael Doleac, Andre Miller and Keith Van Horn. Möttölä made the most of his time in Utah, grabbing an All-America award in basketball and in economics, which is not something that every basketball player can boast of. The biggest moment for the player in his time in America was the NCAA title game when the Utes were less than 4 minutes away from victory. As it was, Kentucky bounced back and held firm to grab the title. Sometimes you learn more about yourself in defeat, and this will be the sort of experience that Möttölä will be providing his team-mates with. Möttölä then made his way into the National Basketball Association and he was the first ever Finnish player to play in the league. Möttölä played for the Atlanta Hawks and even though his professional career has now spanned 14 years, he is still playing and loving the game. He may be 37 years old but he has a lot of energy and vitality left in him and is looking forward to the World Cup. Möttölä left the NBA all the way back in 2002 and he has been on a tour of Europe ever since. His club career has seen Möttölä play in Spain, in Italy, in Russia and in Greece although he is now playing for Helsinki Seagulls, his hometown club. There is naturally an expectation that this is where Möttölä has come to retire but he has been an integral player for the team and the Seagulls will no doubt be looking for him to stay involved with the team. There may not be too much experience in the Finnish camp, but on Saturday, Möttölä will lead his team into the first of five group games with pride. The fact that the game is against the Americans means that Finland are up against it from the start, but you may as well go in against the favourites at the start, as this is sometimes the time when shocks occur. 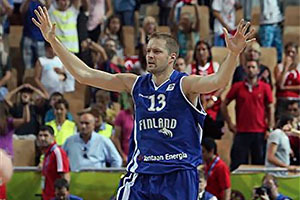 They may have gained their place at the 2014 FIBA World Cup thanks to a wild card entry, but now that Finland are finally on the biggest stage in international basketball, they are all set to enjoy themselves.